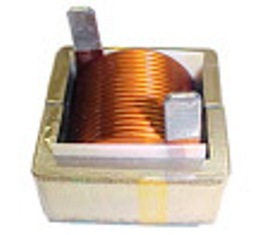 The AC Series inductors from CWS, Coil Winding Specialist, Inc., is designed for use in a series connection with a capacitor to act as a filter to remove ignition noise or alternator noise from car stereo systems. Filters made from an inductor connected to a capacitor form part of the crossover filter in a car stereo system. A car audio system will not sound as good without a crossover filter. All car manufacturers install some kind of crossover filter system in their car stereo system. These filters could range from a very basic system to a very complex crossover system, depending on the desired quality of the stereo system needed in the car. A crossover filter is a filtering device that limits the frequencies that reach a speaker. The filter basically splits a music signal into separate frequency ranges and sends them to speakers that are designed to best reproduce each frequency range. For instance, only high frequencies are sent to the tweeters, midrange to the mid range speakers, and low frequencies to the subwoofer. Avoid speaker damage: Speakers are designed to perform only a certain range of frequencies. If other than the designed frequencies flows into the speaker, then the speaker will produce distortion, which can damage the speaker itself. Overall balance: If a system with sub-woofers, and full range speakers does not have a crossover filter, then the sub-woofers will be performing, for example, from 20 to 1000 Hz, while the full-range speakers will be performing from 60 Hz, all the way up to 20,000 Hz. As it can easily be seen, there is an "overlap" of frequencies between 50 and 1000 Hz. In this overlap region, the levels are higher than levels below 50 and above 1000Hz, yielding a non-balanced system. There are 3 types of crossover filters: High-pass, low-pass and band-pass. A high-pass crossover filter will block low frequencies, a low-pass will block high frequencies, and band-pass will block low and high frequencies below and above crossover points. Crossover filters designed using inductors and capacitors do not block undesired frequencies completely. Crossovers cut frequencies progressively. A crossover "slope" describes how effective a crossover filter is in blocking frequencies. The minimum slope is 6dB/octave. For example, a high pass crossover filter at 1000 Hz, will let anything above 1000 Hz to pass and will attenuate all frequencies below 1000Hz. At 500 Hz (1 octave), the level at the speaker would be 6dB less. A steeper slope (i.e. 24dB/octave) will block undesired frequencies more effectively, but will cost more than a lower slope crossover. If a speaker is performing near its frequency range limit, then a steeper slope cutoff is needed. For example, a mid bass rated at 50 Hz on the lower range could be crossed over at 55 Hz or 60 Hz with a 24dB/octave crossover. If a shallower slope crossover is desired, then the frequency would need to be higher (i.e. 100 Hz at 6dB/octave). So what are good crossover frequencies? It largely depends on the car, the speakers, and the speaker location. Typical crossover frequencies are 100 Hz (bass), 350 Hz (mid bass), 3500 Hz – 5000 Hz (highs). Active crossovers (and equalizers) need external power to operate and work at low signal voltage levels (RCAs). Signal from the head unit RCA's is split into low-frequencies (bass), mid-frequencies (mids), and high frequencies (tweeters). These signals then go to different amplifiers. The advantages of active crossover filter is that the signal is not affected as much, since everything is done at low voltages, before the amplifiers. There is much more flexibility, since all that is needed to adjust crossover frequencies is to turn a knob, while on passive crossovers, the components have to be replaced. The problem is that more amplifier channels are needed to go to all the speakers. The passive crossover is very common. It is basically a capacitor and an inductor installed on the speaker leads between the amplifier and the speaker that prevents certain frequencies from reaching a speaker. It's relatively inexpensive and easy to install. Passive crossovers work after the amplifiers, receiving high signal levels. Since all the frequency splitting is done after the amplifiers, more speakers can run off an amplifier channel, obtaining maximum power by playing with the resistances "seen" by the amplifiers. Passive Crossovers are capacitors and inductors either in parallel or series, or combinations that are added to cut off highs and/or lows. A capacitor stores voltage, acting as an open circuit (blocks off signal) at lower frequencies, and acts as a short at higher frequencies (lets signal pass). An inductor, on the other hand, stores current, acting in exactly the opposite way of a capacitor. Inductors act as shorts at lower frequencies, and open circuits at high frequencies. If a capacitor is hooked up in series with a speaker, it will be a high-pass crossover (signals at lower frequencies will be blocked, and higher frequency components of the signal will be allowed to pass). An inductor in series with a speaker will be a low-pass filter. Subwoofers need inductors in series (low-pass), while midranges will need both a high-pass (cut bass off) and a low-pass (cut higher frequencies that tweeters will be taking care of). Tweeters need also high-pass filters, to block lower frequencies. There are many types of passive crossovers that can be implemented, starting with the capacitor or inductor in series, and getting complex as more capacitors and inductors are added. The CWS’ AC Series of inductors are ideally suited for both active and passive crossover filters. Please select the inductance and current rating as shown in the data sheets. It should be noted that capacitors and inductors dissipate power which could have been used by the speakers. As more stages of capacitors and inductors are used to perform filtering, more energy is consumed by these components.